This last weekend has been the first weekend in a month with nothing extra planned. No guests. No big events. No trips away. We relaxed, and boy did we need it. The kids lay around and read, a movie was watched, the tree was decorated, and a little cooking was done. I whipped this up to take to church on Sunday afternoon, based on the fact that at this time of year, there isn’t much ready for harvesting, but there is always plenty of rhubarb on hand. Meg came out and helped me harvest it. 1. Place the flour, icing sugar, and butter in a food processor and process until the mixture resembles bread crumbs. 2. With the processor running, add in the egg yolk followed by the water. 3. 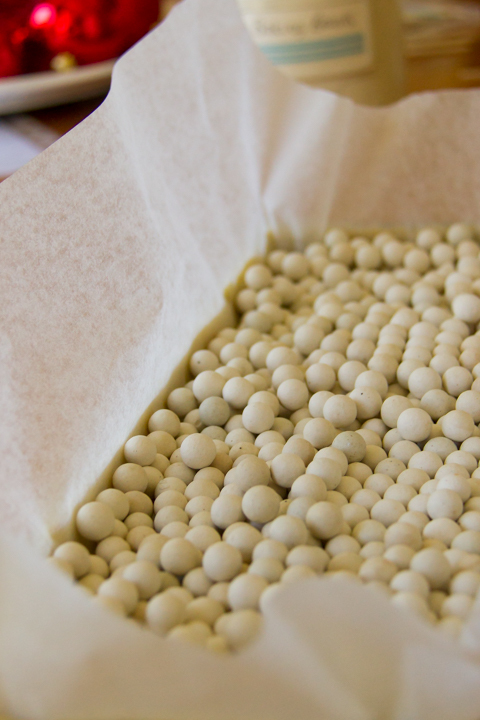 When the mixture forms a ball, wrap in cling wrap and refrigerate for at least 30 minutes. 4. Roll the dough 1/2cm thick and line a greased flan tin with it. 5. Trim the excess pastry off, then prick the base with a fork. 6. Blind bake at 200*c for 15 minutes. Allow to cool. 7. 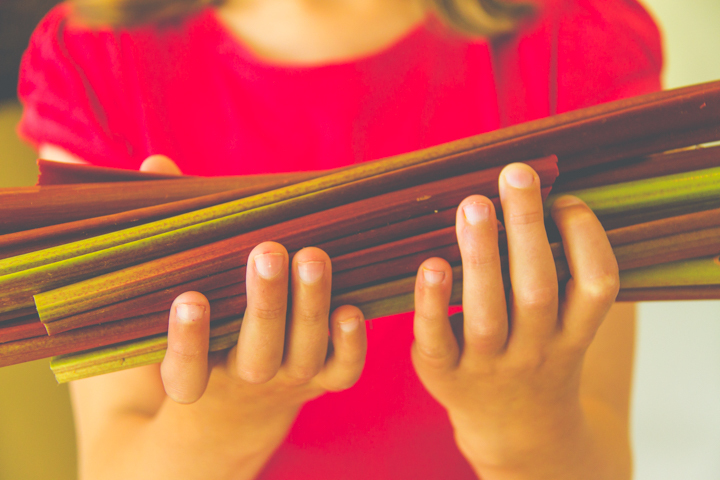 Wash and cut the rhubarb into 10cm lengths. 8. 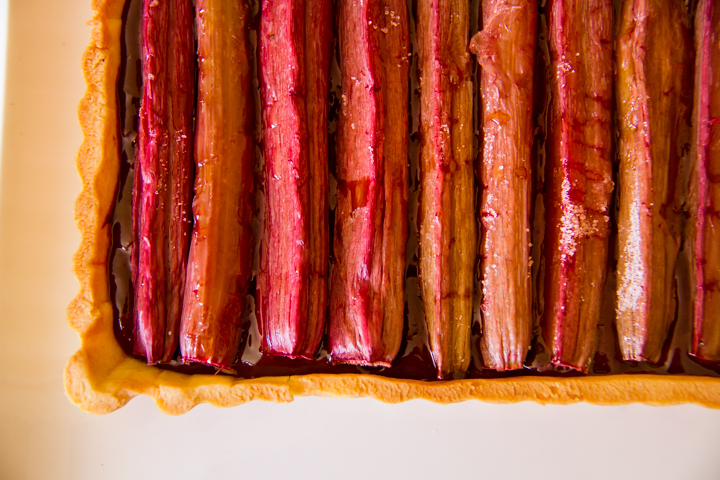 Place the rhubarb in a baking tray, sprinkle with sugar and drizzle with vanilla. 9. 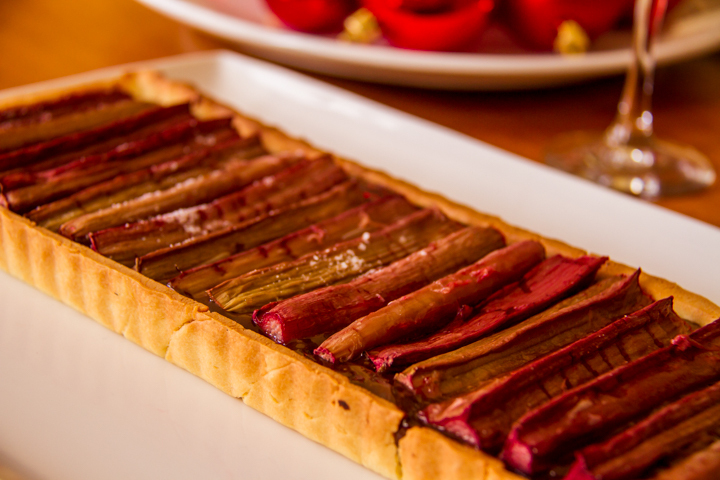 Place in the oven and roast for 15 minutes or until the rhubarb is soft but not collapsed. Allow to cool. 10. In a microwave proof jug, heat the cream for 1 minute in the microwave. 11. Pour the cream over the chocolate in a bowl. Stir until all the chocolate is smooth and dissolved. 12. Stir the orange zest through the chocolate mixture. 13. Allow the chocolate mixture to cool and thicken in the fridge (I popped mine in the freezer for 10 minutes and stirred it twice). 14. Pour the chocolate mixture into the pastry and smooth it out. 15. Carefully place the rhubarb over the chocolate. 16. Allow to set in the fridge before serving. I took it to church, but none came home with us (much to my disappointment). What was your weekend like? Bake anything yummy? ?